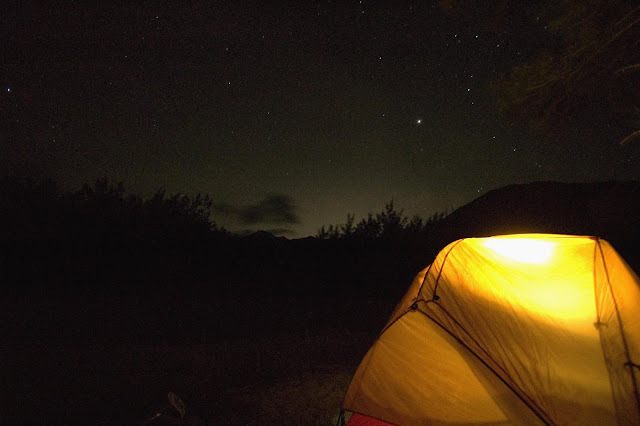 I longed to sleep under the stars again, with nothing but the canopy of trees between me and the skies. It's a privilege to experience it again in Anawangin. Even lacking sleep, I have to pinch myself waking up several times during the night as I brush away the small crabs that crawl across me and realign myself on my sleeping bag, looking contentedly at the stars peeking through the pine trees, hearing the lapping of waves on my left, the rustling of leaves on top of me, and the hooting of nocturnal animals to my right. This is bliss, indeed. Nice blog with a very refine English...good thing that I found my way here thru Ferdy's blog. Honestly, star gazing is also a good medicine for relaxing.....from the pressure of this exhausting planet. Siquijor is also a good place for globe trekker like you....if you want exactly an escapade avoiding the noise of the city and the political issues..go to Siquijor and you'll be relaxed....promise dude. bro eric, i've always been interested in hiking siquijor. call it serendipity but i will indeed ask you (probe you is more like it :-)) for details. thanks for dropping by!